Patricia Reitz’s fascination with cooking started when she was a child. While growing up in New York City, she would stop on the street to peek through windows of pizzerias, delis and bakeries to watch a dish come together. Now, the Frederick County resident is creating her own meals and documenting each recipe on her blog www.butteryum.org. Reitz, 49, has blogged for nine years. Her journey began thanks to an online baking forum on which she was actively posting. “ Someone said, ‘ You’re very knowledgeable. You should start a blog.’” Now, there are more than 500 recipes on “ ButterYum.” According to Reitz, her blog sees an average of 1,000 visits a day. She finds inspiration for her recipes by visiting farm markets and browsing fresh and local ingredients. Currently, Reitz’s matcha brownies are popular among her followers. The dessert features the Japanese green tea powder known as matcha. The powder is known for its antioxidant benefits and lightly sweet flavor. But not every dish Reitz has tried for the blog has been a success. “I tried an Italian version of my meatloaf recipe, but it didn’t work out,” she said. That dish didn’t make it onto her blog. One of the reasons Reitz wanted to start “ ButterYum” was because she didn’t have any old recipes from her mother or grandmother. motivated her to catalog her recipes for her family through the blog. She struggled with her online endeavor at first. “ In the beginning, it was rough,” she said. “ I didn’t know how to write a recipe or take a good picture.” Her first post was photos of cakes she had made, and her first recipe was for roasted chicken. The lighting was off in her kitchen, which gave a yellow cast to her photos. She has since learned to use the natural light that shines through the large windows in her dining room. When she writes recipes, Reitz now also knows to list each ingredient in the order it is used and then by amount. Through her blog, she doesn’t want to simply share recipes, she also wants to teach people how to cook. Her recipes are dotted with tips, tricks and the best brands of ingredients to use. Her family is very supportive, especially when it comes to waiting patiently for dinner as Reitz takes pictures of their plates before mealtime. Reitz has 30 years of cooking experience, but she didn’t learn her culinary skills from her mother, who, she said, “ didn’t cook much more than roast and vegetables.” She has held on to a curiosity for cooking all of her life. As a child she remembers racing to the television on Saturday morning to turn on a cooking show before her siblings had a chance to select cartoons instead. “ The Galloping Gourmet” with Graham Kerr and Julia Child’s “ The French Chef” were some of her favorites. As an adult, she was the person friends and family would call when they had a cooking question. Reitz had thought about going to culinary school, but she said she got married instead and had children. She is excited her blog has received so much attention. She currently has more than 6,690 followers on Pinterest and more than 700 likes on Facebook. Reitz’s recipes have been featured on the BuzzFeed website several times, including her éclairs, spicy sweet potato fries and fancy scrambled eggs. Her dishes have also shown up on the website tastykitchen. com, which was created by Ree Drummond, also known as The Pioneer Woman on Food Network. Strawberry sorbet, 10- minute cream of tomato soup and baked Denver omelet are some recipes on Tasty Kitchen. She has also served as a guest blogger on other websites including “ Or So She Says” at oneshetwoshe. com. Because of her blog, Reitz was invited to teach classes at Nibblins, and because of that experience, she also teaches through the City of Winchester Parks and Recreation. She also gave a cake demonstration at the second Shenandoah Valley Cake Festival this year. In the future, she plans to start making cooking videos to post on YouTube. Reitz’s Greek pearl couscous salad is light and fresh for the summer. The side dish features mini cucumbers, sliced olives, grape tomatoes and red peppers that are tossed with pearl couscous. The blend is married with a homemade Greek dressing that includes extra virgin olive oil, feta cheese, oregano and basil. This Greek salad is an original recipe inspired by a similar dish she sampled at a neighborhood get-together. Reitz’s mini strawberry banana muffins are simple to throw together and require basic pantry ingredients like flour, cinnamon and eggs. 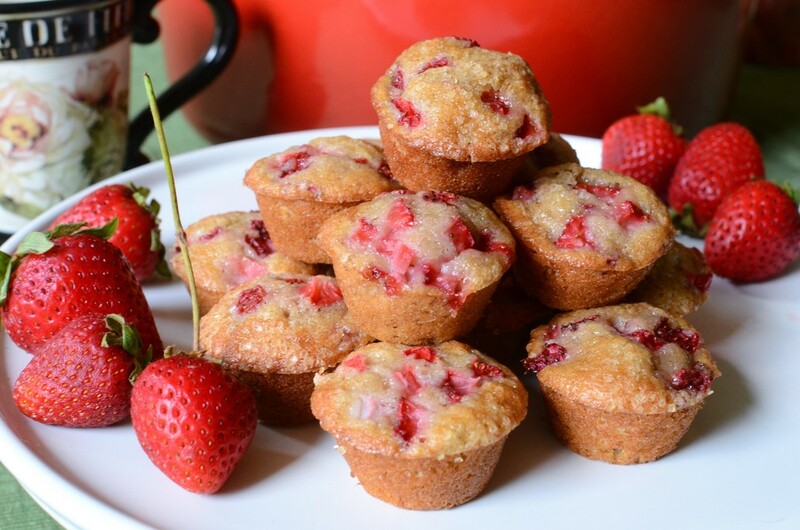 Mashed banana and diced strawberries add flavor, and the banana helps to keep the muffins moist. These muffins were adapted from noreenskitchen, com. Any posts on Reitz’s blog that are inspired or adapted from another public source is noted under each recipe. To see all of Reitz’s recipes on her blog, visit www.butteryum.org.